I am Stephanie Pleasants, a work at home mom and freelance web designer. Find me on Google+, Facebook, and Twitter! Is someone using your website images? It happens. Mean people swipe your photos and images and use them on their own website. Here’s a quick way to check to see if any of your images have been indexed by Google from someone else. How cool is that?! Is it fail proof? Heck no! But, it’s a nice and easy way to at least take a peek and see if your image is posted (and indexed by the Great Goog) on another website. What should you do if someone is passing off your image as their own? Politely contact them and ask them to remove the image or provide a link and credit back to you. Keep it polite, some people just don’t know image borrowing protocol. Take this as an opportunity to share your knowledge (and grab a link back!). You worked all day to get the perfect blog post. You are so proud of how it turned out and now it’s time to share it on those social networks. 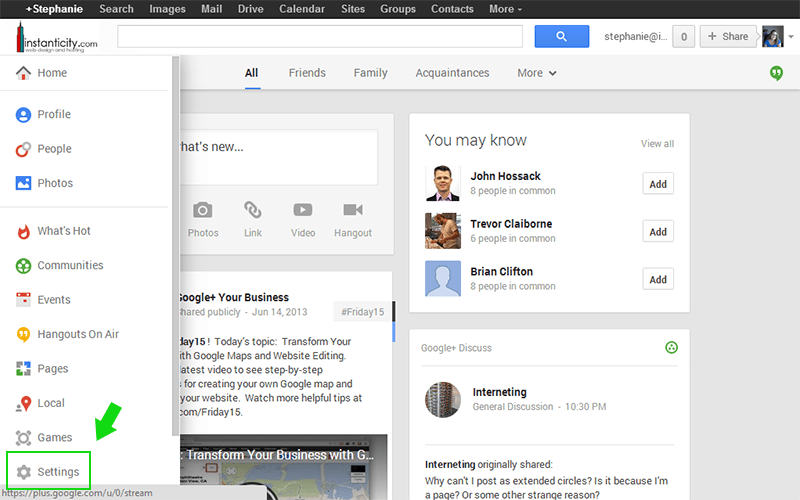 Easy enough for Twitter and Facebook, but for Google+ you’ll have to do it manually for now. 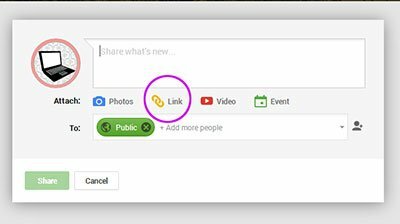 Did you know there is a right way and a wrong way to share your link on G+? There is! 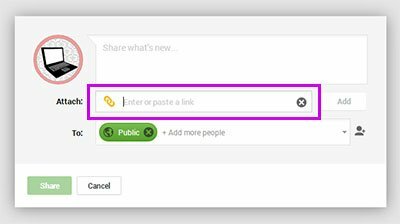 When sharing your blog link on G+, you MUST use the link box, not the text box. If you post your link using the text box, your link will be tagged at a “nofollow” link. By using the link box, you’ll be getting a “dofollow” link. What the heck and why does it matter? When trying to get links back to your site, always seek out the dofollow links and stay away from nofollows. Did you know comment links on BDWG are dofollow? Say ‘thanks’ with a comment earn a linkback! Bombarded with G+ notifications? 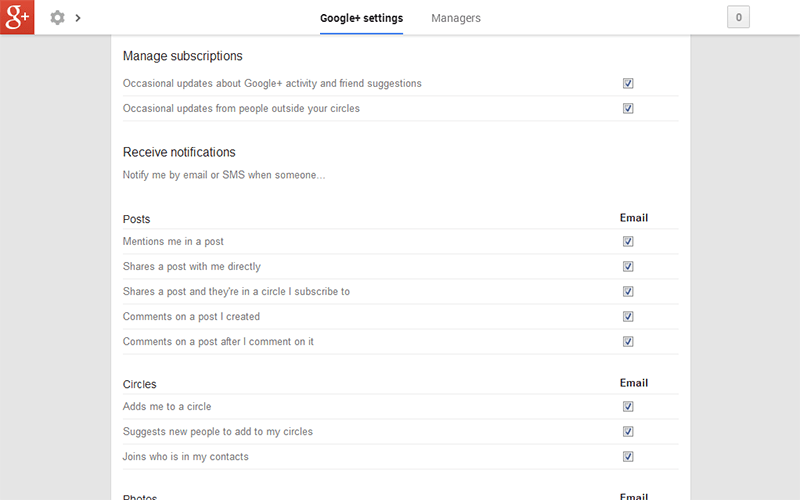 Want to turn off those Google+ notifications that land in your inbox. I don’t know why Google made this setting so hard to find, maybe they took a note from Facebook. These directions assume you are accessing Google+ on your laptop or desktop computer, not a table or smartphone. First, let’s look at your personal profile. To change your notifications, first hover on the home icon in the upper left corner. This will cause a slide out menu to appear. At the very bottom of this menu you’ll see “settings”, click that to bring up the next page. On the settings page, you just need to scroll down a bit to the notifications section. At the top you can choose which email address should receive the notifications. Right below that you can urn off and on notifications for both phone and email for several different actions. As with all Google services, changes are automatically saved for you. It is my understanding that pages have their own settings. 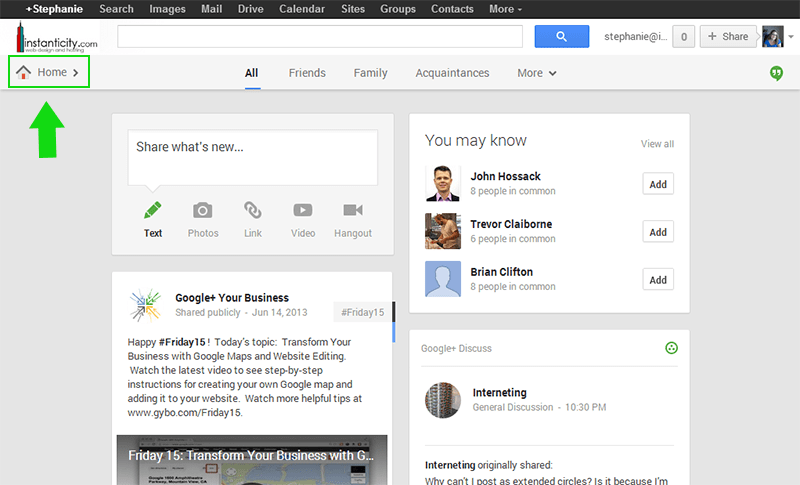 Go to your G+ page and scroll to the very top of the page until you see your page’s icon in the upper right. Click on the little arrow next to the icon, this will show a drop down with a settings link. Just as before, scroll to the notifications area and uncheck the boxes you desire. In your Google communities, there is only one option- disable or enable new post notifications. I don’t have a screenshot, sorry, but if you look on the left side, just above the community photo, you’ll see a little bell. Click that to enable or disable notifications. And that’s all there is to it. A little hard to find, but fairly easy once located. I absolutely love working with WordPress. I specialize in WordPress Webdesign because I’ve found that wordpress can meet the needs of just about any website owner. WordPress scalable and can grow as your website grows. It’s easy to learn so you can manage your website on your own if you desire. WordPress has evolved to more than just a blog platform. WordPress is now an all purpose content management sytem. With the thousands of plugins and themes available, WordPress can become just about anything you could ever want or need. WordPress has been used by MSNBC, Best Buy Mobile, Justin Timberlake, and many more. 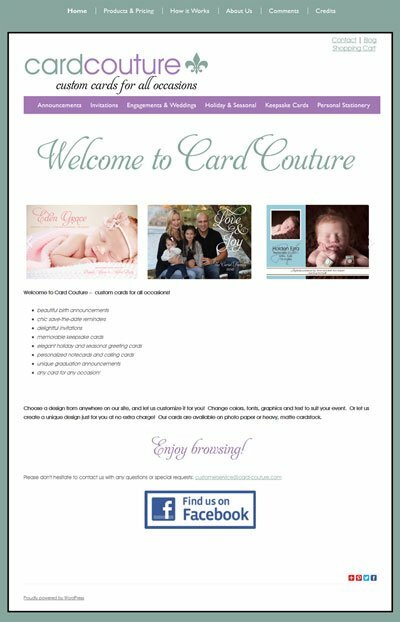 Card-Couture.com is custom greeting card company. Using custom post type and a few plugins, I was able to integrate Mal’s e-commerce checkout system and the ability to gather customization information upon purchase. In addition to running an online store for their cards, the owners can blog on the same domain name to help strengthen their search engine ranking. Think Photography is a DC based photographer. This is a nice, clean and simple site with emphasis on the photos. The greys and black on white allow the photographs to take center stage. 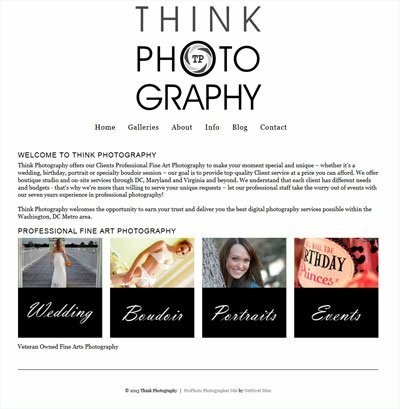 WordPress is a great option for a portfolio site. A much needed Google+ Cheat Sheet! 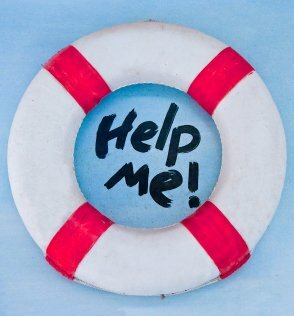 Are you drowning in social media? Having trouble finding time to “do it all”? Stop! Do not stress yourself over something so crazy. I’m giving you permission to step back and take a break. Finding time to balance it all is difficult. You need to keep learning about your industry, you need to keep in touch and reach out to clients. If you aren’t careful these two simple acts can consume your entire day leaving you no time to run your business. Isn’t that the reason you have these accounts anyway?! If you’re stressed and worn down, how can you run your business? Set up your profiles and optimize them. You don’t need to have an account on every social media site. Find the ones most relevant to your industry and get your profile set up. For most people, that will be Facebook, Twitter and Google+. Turn off almost all notifications, get rid of those distracting emails you get each time someone comments on your status on Facebook or G+. The only notification you need is when someone contacts you with a private or direct message. Those are the ones you want to get and respond to right away. Everything else can wait. Now, make a schedule and stick to it. Allow yourself a 10-20 minutes per day to hop on and be active on these networks. Or, cycle through them concentrating on one each day. So, you might miss a posting or two. It’s ok. You don’t have time to read and respond to everything. No one expects you to read it all. That’s why you must be posting links to blog posts more than once (different times and different days). You’re thinking “Hey, I want to look active throughout the day on Facebook/Twitter.” No problem, use a service like Tweetdeck, Buffer or Hootsuite and schedule your posts and retweets. But, really, there is nothing wrong with only doing your Twittering in the evening while watching tv with your husband (guilty!). Who really cares?! Stop watching the time stamps. My personal routine- I am on Facebook throughout the day, everyday. I keep in touch with family members, follow a few people that I enjoy learning from and keep up with my clients. I pop into Twitter only every few days, usually in the evening. I don’t do a lot of Twitter. I follow a few people I like to learn from and I retweet things occasionally. Ah, Google+, you and I are still defining our relationship. Google recommends that you be active every 72 hours. That’s every three days. That’s it. They aren’t expecting you to be there daily. My plan with G+ is to pop in every few days. And that is OK. So there you go, starting right now, you have permission to slack off! Create a plan and stop knocking yourself out trying to keep up with everything, you have a business to run! We all want to be noticed Google, isn’t that what we spend our every day doing?! Sure, but I want to focus on that little photo you’re seeing when you do web searches. That little thing we refer to as Google+ Authorship. I’ve said it before and I’ll say it again, we are a visual culture. We want to see things. Admit it, you’re more likely to pay attention to something when there’s a pretty picture to see. Have you see search results like this? Do you have an image next to your search results? Do you know how to get it there? Google+ Authorship will increase your click throughs. Right away, you see me, as a real person, before you even get to my website. You know instantly I have taken the time to reach out to you and I’ll bet you have a little more confidence in me than you would if you didn’t see my photo right away. 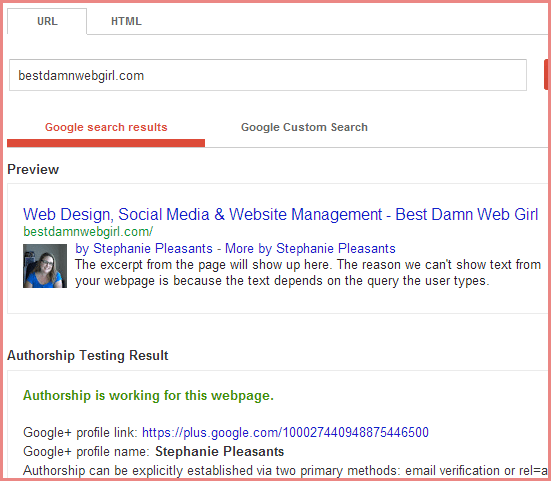 Let’s get your photo on Google and get your site Google+ Authorship ready. It’s a given. You want to dominate Google, you have to play the Google game. Go ahead and register and set up your profile. Your profile photo MUST be a headshot. Don’t use an image of an animal or a flower, or even representation of your work. You photo needs to be YOU. It would be ideal if your email address is the same as your domain name. You must verify your email address. Have more than one website? List more than one email. Google says as long as you add your email address and have a byline with your name on your website, you’re all set, but let’s make it foolproof! In your profile, you’ll see a contributor area. List your website(s) here. If you regularly post on a website, get it listed here. Not only is this another link back to your website (SEO check! ), this is one way Google connects your profile to your website. 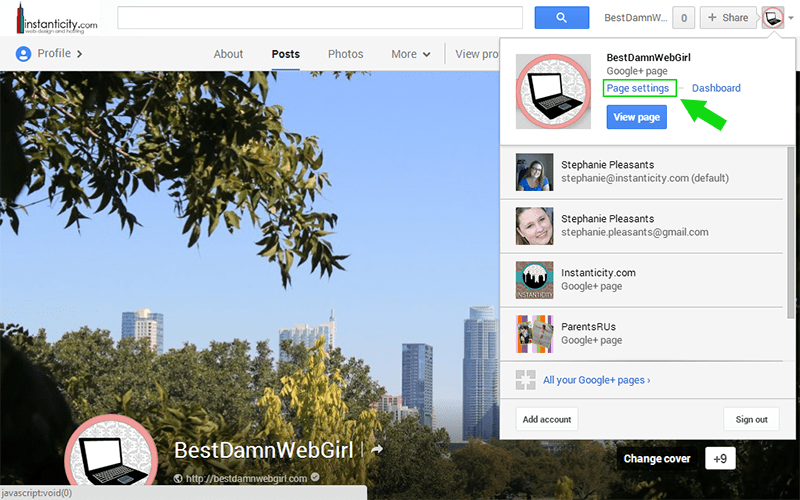 On your G+ profile, click posts, now copy that URL. Let’s head over to your website. We’re going to do a few things over here. The first thing we’ll do is get a link over to our Google+. You do have linked social icons, right? If you haven’t already, now you must add G+. My recommendation is Facebook, Twitter and G+ (in that order is my preference). Add in that icon and link it to https://plus.google.com/100027440948875446500/posts (this is the URL we just copied from G+, this particular link is my profile). If your blog does not show the line “posted by ____”, re-enable it now. You need to let Google know that you posted that blog post, page, article or whatever. The name in your byline should match your profile name, first name only is perfectly fine. Ideally, we want to add rel=”author” to the markup, in some wordpress themes that is not as easy as it sounds. Drop me an email and I’ll let you know if it can be done, how to do it, or I’ll do it for you. If it can’t be done, worry not, it’s just one more thing we can do to speed things along, but definitely not a deal-breaker. We’ll get around it by using our SEO plugin (which you are using, right?). There is very likely a place in the plugin settings to add in your Google+ profile ID, that’s the string of numbers. Plug in in there as well. This will add a line in your header telling Google that you are the author of this website. This is the direction we are headed and you are now prepared! You’ve got 140 characters to get your message across the right way, the first time. If you’re just starting out or not sure how to “twitter”, then this post is for you! Here are a few tips to make the best of your Twitter time. Mentioning others in your tweets gets you noticed more. However, when you begin a tweet with @, the only people that see the tweet are those that follow both you and the user you mentioned. By placing a period before the @mention, everyone will see it. The alternative is to place the @mention at the end of the tweet, but you then risk the mention being dropped on a retweet. An @mention at the beginning means low visibility, but a period before the mention means high visibility. #Hashtags are used to categorize tweets and make them a tad easier to search. Hashtags are Twitter. If you see a hashtag followed by text anywhere, you know to go to Twitter and search for it. While you can search for any phrase on Twitter, the hashtags brings it all home. Hashtag anything, anywhere and you are driving peeps to Twitter. As with everywhere else, images get noticed. Attach relevant photos to your tweets occasionally and you’re likely to get more response. We are visual people. We are more likely to share a photo than just a text quote. Give the people what they want- something to look at every once in awhile. You’ve spent the morning typing up your best blog post yet. You put so much time into this one, you just know people want to read it, and should. Hmm. How will they find it? How do you get the people to the post? Where do you share the link to get the traffic you’re looking for? Well, you could wait on Google to rank it and see if it turns up in the search results. But, that takes too long. You could pay for ads on Google or Facebook. But, that’s too costly. So, you do what all bloggers do, you share it. There are many, many ways to share and promote your post, but I’m going to highlight what I feel to be the Top Five. Facebook is a place to interact with your fans. Most people are going to hit that LIKE button because they want to hear what you have to say. Blog posts definitely need to be landing here. Always include an image, always. Images get noticed. Images get shared. A link with an image is great. You could also post an image and put the link to your blog post in the description area. It’s been said that images get shared more often than links, but I doubt links get clicked when just attached to an image. Either way, make sure some interesting image is included when you share your link. Twitter is another, smaller, place to interact with your fans. 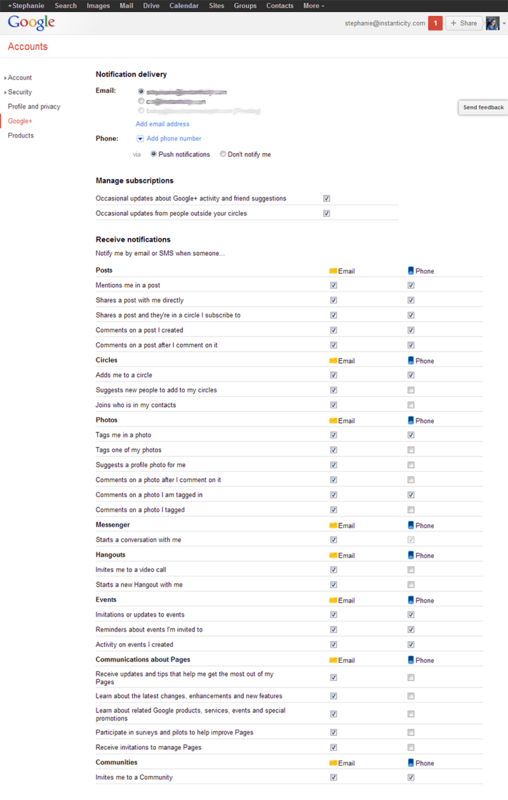 Do not assume that your Twitter followers are also on your Facebook list. I definitely have some people/sites/things that I follow on Twitter and not on Facebook and vice versa. It’s partly my way of organizing my stuff. You should definitely tweet every blog post! When you post to Twitter include your blog title or something catchy and a shortened link. Be sure not to use all 140 characters, leave some characters free. Your goal is for people to retweet, possibly with a comment of their own. Users of Digg, StumbleUpon, Reddit and Technorati are looking for things to read. Submit your blog post and give them something! You don’t need to use all of these, just pick one if you want. I don’t have time to focus on them all so I plan to only use one. This would be a great place to get blog ideas as well. Bonus! I don’t recommend doing this for every blog post, but definitely the good ones. Just add a link to your email signature. I use Wisestamp for this purpose, easy to set up, easy to use. It works! I’m running a fundraiser for my son and I put the link in my email sig and I have actually had people follow the link and donate. (You can too if you want!) Awesome! Yeah, yeah, I’m telling you to do something I don’t do, yet. Oh, well. If you run a newsletter, add a blog post link or two to the next one you send out. People subscribed because they want to hear from you. I’m sure you’re looking for newsletter content, use what you’ve already written. This is just another avenue to reach out to the people that have expressed interest in you. Facebook privacy settings, always changing and always needing reviewed. Facebook is rolling out new Privacy settings by the end of the year and, as always, it’s important that you take a few minutes, look it over and make sure things are set the way you want them. Assuming it’s in everyone’s best interest, and something everyone would want, any new feature they introduce will be enabled by default so reviewing the Facebook privacy settings when they come out is always important. One new feature this time around is the Search Engine feature. 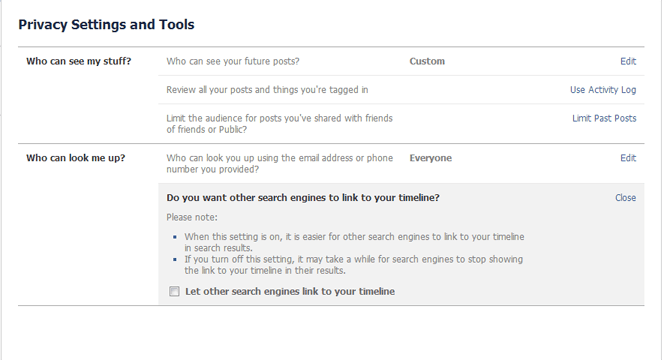 By default, the setting is on so that search engines may link to your timeline. I, personally, don’t want that happening! For my public pages, that is absolutely fine, but not for my personal profile. Scroll down to the Who can look me up? section and the bottom option refers to search engines. Do you want search engines to link to your timeline? Click the edit button and turn that feature OFF! 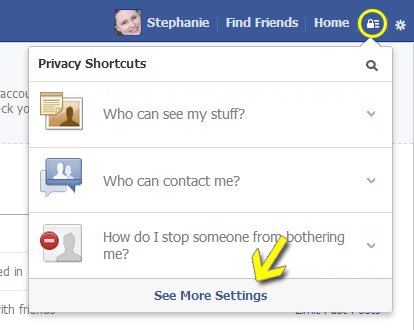 If you want read more about Facebook’s new privacy settings, AllFacebook has a good article to read.